Ask fellow campers about "Tanglewood Park Campground" and nearby attractions. Beautiful setting. Small campground with private feel. Check-in was easy, hosts were very friendly. Decent spacing and fairly level sites. Though a few are far from level. Two dog parks, several hiking\biking trails. Cable was a bonus. We saw security driving around several times throughout the day. No fires was slightly disappointing. Great early season stop on our way to FL. We want to come back when trees and flowers are in bloom. We camped at Tanglewood Park Campground in a Fifth Wheel. Check out the nearby breweries and pizza places. Our second stay here. We stayed once last year for a few nights, and knew we had to come back. We stayed two weeks during an October visit with family in Winston Salem. We were lucky enough to experience Hurricane Michael - 40mph winds came through for about an hour. Lots of downed branches, but the power stayed on. And the next day, everything was cleaned up -- the staff here is really awesome. Very friendly when we showed up late for check in, helped us into our site. Showed up after the storm to make sure everything was OK. The staff all over the park is really top-notch. We like the off-leash dog park on-site; just be aware that park staff is protective of the turf in the dog park, and close it whenever there's lots of rain. Can't complain though - it really is a great dog park. Sewer hookups are at the very back of the site. We needed every inch of our 20 foot sewer hose. This RV campground is a hidden gem, one of the best municipal campgrounds we've ever visited. 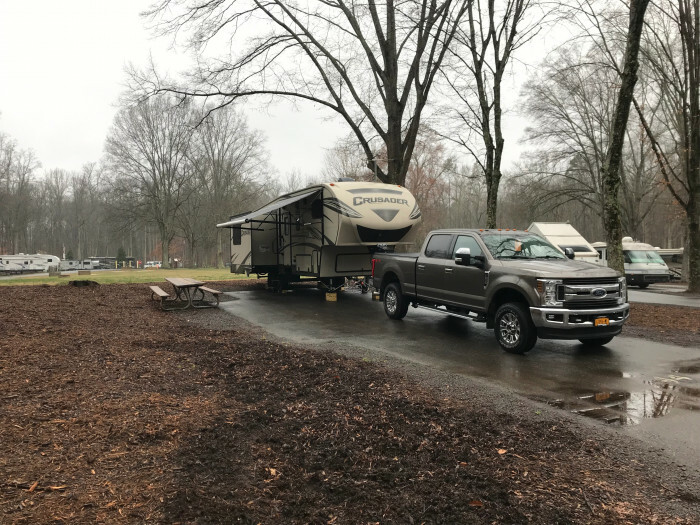 We camped at Tanglewood Park Campground in a Fifth Wheel. We stayed during the Carolina Balloon Festival over in Statesville. Some of the other campers convinced us to go out there. And it was awesome! If you have the opportunity to attend the Balloon Festival, I highly recommend it! This is one of our favorite parks. VERY Clean and convenient to shopping. 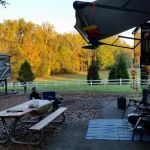 Very important for us full time RVer's to get recharged for the next adventure. . (Laundry, Food, Post Office) The park has a 2 mile paved trail that's dog friendly with dog stations through out. Also a Separate Dog park nearby. Levelness of site can be a little challenging as some sites slope more than others. There is a 14 DAY LIMIT per 30 days. They have 44 sites. We camped at Tanglewood Park Campground in a Travel Trailer. Tanglewood is about a mile off I-40 which is very convenient. It is pretty quiet but you can hear road noise from somewhere especially in the morning. The staff is extremely friendly and helpful from the check-in to the camp hosts. Lots of things at this park - cottages, manor house, tennis courts, ponds, hiking/biking/horse trails and a bunch of other stuff. There is canoe access to the Yadkin river. Many locals appear to take advantage of the amenities. It is a nice looking park where most sites have semi shade and all are paved. The spacing is decent but there is no privacy. The downside is almost every site is extremely un-level, mostly dropping from front to back. Big rigs would never be able to level in these sites. We had the only pull-thru site which was plenty long enough but we had to be satisfied with almost level. We could not use the WII FI from our site. We did not try raising our Directv dish so don't know if we had coverage but it is doubtful due to trees. Verizon was strong at 4g 4 bars. We would stay here again but would be selective on the site. We camped at Tanglewood Park Campground in a Motorhome. This park was literally an oasis in the storm. We were evacuating from Hurricane Florence and attempting to get as far inland as possible to ride out the storm. We booked this wonderful county park (Forsyth County) and could not have been happier. The campground sits high on a hill - so flooding was never a worry. The sites are shady and completely surrounded by tall oak trees but we felt comfortable that we were far enough inland to avoid extremely high winds. The sites are all back in (it is advertised that they have pull thrus but they only have ONE) so count on backing in. The pads are asphalt and nice and wide with picnic tables. The campground is separate from the rest of the park but all amenities at the park are available to campers. They include: swimming pool, a couple of golf courses, horseback riding, guest houses and cottages to rent, numerous walking/biking trails and the best dog park on the planet!! The staff at the reservation desk was extremely helpful in getting us reserved and adding to our reservation more than once! The camp hosts meet you at the campground entrance and guide you to your site. I heard from others that the wifi was spotty (we carry our own) but the cable was excellent. Great place to stay! 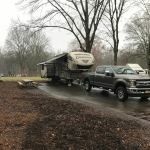 We camped at Tanglewood Park Campground in a Fifth Wheel. Visit Old Town Salem while in the area. We had full hookups with WiFi and Cable TV. Sites were spacious with easily maneuverable, paved interior roads. At check-in we were greeted at the Welcome Center who then radioed our arrival to the on-duty host. The host met us at the entrance to the campground and escorted to our site and also helped us hook up the cable TV. 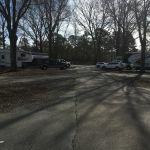 The campground is clean and appears to be well maintained. Tanglewood Park abuts up to the campground and is heavily used by the general public. We camped at Tanglewood Park Campground in a Motorhome. This park has come a looooong way from years ago, when it was run down and sorely neglected. Today's park offers fast and reliable WiFi, cable TV, wide and paved interior roads and sites, dog runs, dog poop bags & disposal stations and lots of tree coverage. Registration was super easy and completed online, well in advance of our stay. Upon arrival, we were nicely greeted at the Welcome Center, and given a packet of pertinent information. Apparently, they radioed news of our arrival down to the on-duty host, and we were met by the host at the entrance to the campground and escorted to our site. The park is clean and well maintained and quiet at night. The 3 volunteer host sites are away from the campers, but they are well marked and easily available should the need arise. The jogging trail runs right beside the short side of the campground, and right behind a couple of the sites. So, if you're a light sleeper, you may wish to select a site closer to the other side of the park, as some of the joggers can be a bit loud early in the morning. We camped at Tanglewood Park Campground in a Motorhome. There is a pool farther into the park grounds, but there is an additional daily fee to use the pool. Your camping reservation entitles you to a discount. There are miles of well marked hiking & biking trails within the park itself, not the campground. Ketchie Creek Bakery, in Mocksville, is still putting out amazing and delicious food! Try their eclairs and brownies, you won't be disappointed! This is a lovely campground in a beautiful park. The campground consists of 3 rows not counting the entrance row beside the host sites. All of the campsites have decent shade except 1 through 7 and 38 through 44. The dog park is very close to the campground and is huge! This should not be a concern to anyone without a dog as the park is far away not to be heard. But if you like to have a place for your dog to run, you will enjoy this proximity. There are also many trails for walking, running, and biking. Our only impression about the campground is that it is unnecessarily "fussy." There can be no golf carts. There are only communal fire rings. No tents or canopies are allowed. Hosts are very specific about where you can park, how you must go past the hosts station each time you come and go, etc. We would not let this deter us from visiting the park or the campground. We just thought it was a bit silly. Also in site 1 we did not have wi-fi because of the huge rig parked between us and the source. No big deal to us, but could be to others. We camped at Tanglewood Park Campground in a Motorhome. Tanglewood park is huge and there are lots of trails for hiking and biking. There is an excellent dog park. There are two or three golf courses as well. Winston-Salem is a great place to shop, enjoy restaurants, and look for cultural events. Reynolda Gardens and the Reynolda House are particularly worth a visit. 2nd stay here as we usually stop here for one night on the way for a week of summer camping in the mountains. Great to have the dog park nearby. If you are not familiar with this campground, read thru the reviews to avoid the sloped uneven sites. We camped at Tanglewood Park Campground in a Travel Trailer. Very pretty county park near Winston-Salem. Roads and pads are paved and wide with a large picnic table. Campground is in a grove of trees providing shade but only a few sites can access satellite coverage (cable is available). Sites are mostly long enough to fit tow and very spacious. Campground is immaculate. In the county park is also many walking trails, pool, fenced pet area and much more activities. WiFi was ok but not great. Only major issue with the campground is that almost all the sites are on slopes, many very severe. I asked for a level site and still had the two front tires off the ground. Beware very few site are suitable for large rigs. We camped at Tanglewood Park Campground in a Motorhome. Beautiful park with 1100 acres of activities. Large spacious campsites under tall Oaks. This is a place where you should camp for a few days or more. Would come back for sure if in the area again. We camped at Tanglewood Park Campground in a Motorhome. Would have rated much higher, the beautiful sites were so unlevel, almost couldn't use, even with jacks and blocks. Park area and hiking trails were very nice, just tough for RVs. We camped at Tanglewood Park Campground in a Motorhome. Tanglewood is located in Forsyth County, NC with easy access to I40. The Campground has only 44 sites and all sites have full hookup including cable TV. There are many walking/riding paths in the park and even a dog park near the campground. There are many wineries nearby as well as many fantastic restaurants in the area. A great place to explore or just kick back and relax. Campers only, no tents. Some of the sites are not level enough for Class A and Class C motor homes so check with the park before making reservations. 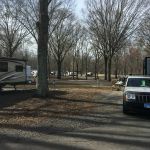 We camped at Tanglewood Park Campground in a Motorhome. Easy access to Winston-Salem, Clemmons, Bermuda Run, and Advance. Lots of shopping, wineries, restaurants, and things to do. Checkin was easy with parking for 2 RVs available. We were sent to the campground, where a friendly host met us and escorted us to our site. Site 32 was on loop 1, and is on a slope. The sites are asphalt and would be difficult for a motor home to level. It was ok for our travel trailer, and this was disclosed prior to booking. The sites are set among tall oaks. Bathhouse was clean, and secured with a keypad combination. Wifi was spotty at our site. US Cellular LTE and Verizon internet worked well. A multi use asphalt trail backs up to the campground, with easy access to mountain bike trails. We camped at Tanglewood Park Campground in a Travel Trailer. There are many amenities At the adjacent park. Campground pass covers the daily entrance fee to Tanglewood Park. Horseback riding, off leash dog park, mountain biking, pool with lazy river and splash area, golf, are all available. After reading reviews we were a bit concerned but visiting family in the area it was the closest park. It was wonderful! We got the only pull-through site which was much longer than our truck/trailer and pretty level. Some sites are not very level front to back so be sure to ask for level site. Beautiful trees shade the spots but don't interfere with roads or site accessibility. Championship golf course nearby with reasonable green fees. Close to shopping. Lovely wooded walk to a stable nearby and botanical gardens. We could have stayed longer if we hadn't been heading back home. We'll be back! We camped at Tanglewood Park Campground in a Travel Trailer. Tanglewood park is huge and there are lots of trails for hiking and biking. There is an excellent dog park. There are two or three golf courses as well. Winston-Salem is a great place to shop, enjoy restaurants, and look for cultural events. Reynolda Gardens and the Reynolda House are particularly worth a visit. Great place for an extended stay. Be sure to visit Lowe's, which in this area is a grocery store! Excellent. Go to Old Salem (which is in Winston-Salem). Bring your bikes to ride at the park (either mountain or "regular"). The park is quiet and lovely. Pizza place just a few miles down the road was good. Nice place to camp, just make sure to read other reviews to help choose your site. Be sure to see Reynaldo House and old Salem. Not far away is Mount Airy, the model for Mayberry in the Andy Griffith Show. Access to great paved trail and dog park from campground. There is a Harris Teeter grocery store within walking distance (0.5 miles). Check out Old Salem while here. There are so many things to do in the surronding area so take a short trip to the Winston Salem Visitor Center for all the information you'll need to help pick and choose your activities. Did tour the Reynolda House house which was home of RJ Reynolds and family. Very interesting and recommend checking it out. Houses one of the great art collections of its time. Shopping just outside the entrance and overall a good place to stay for a day, week or month. Easy access to grocery store, and restaurants. Clemmons is on the edge of Winston-Salem with I-40 running through the area. Lots of restaurants, theaters, golf-golf everywhere. Malls, shopping centers. Groceries are close and fuel is reasonably priced (diesel $2.149). Take advantage of the activities within Tanglewood park, there is a lot to do there. Park has great trails, a dog run, and the Festival of Lights during the holiday season. We ate at Chang Thai and it was very good, and right across the highway! The park has just one pull-through site, which is quite long and perfectly level. If you make an online reservation and site #10 is open, grab it. While we were there, park employees were putting up Christmas lights throughout the park that will begin on November 21. Great park for biking and hiking. There is a farmers market there Thursdays and Saturdays. The Tanglewood Park championship golf course is a tremendous layout, 7000+ yards, and in reasonable condition, a bargain at $41 with cart. Foothills Brewing is 8 miles away with a superb selection of craft beer. The dog park is walking distance from the RV park. Plenty of shopping nearby. Convenient to Winston Salem with all its shopping, restaurants, etc. Are you affiliated with Tanglewood Park Campground ?